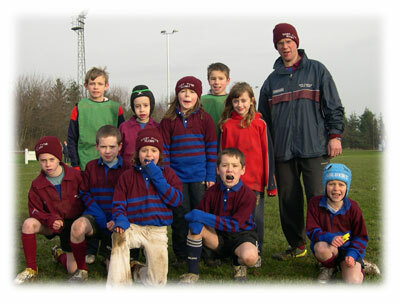 LOCAL junior rugby club coaches and parents have soared to victory in a 174 mile challenge to generate vital club funds. 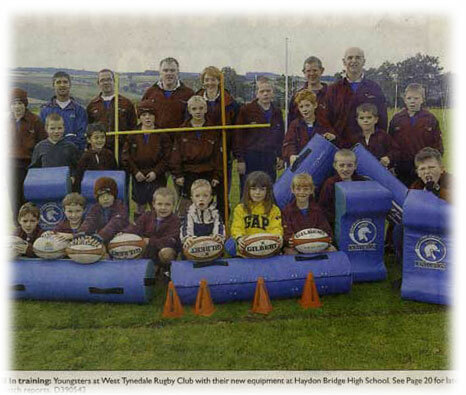 West Tynedale Junior RFC, based in Haydon Bridge, is one of only two non-affiliated rugby clubs in the country. In order to raise money for the club and its junior members, five voluntary coaches and three parents embarked on the 15 hour challenge of a 174 mile bike ride from the west to east coast of England, in a bid to raise money for new team kit and equipment. The club, which is co-ordinated solely by coaches and parents, organised the biking challenge to generate team supplies and promote further awareness of the club, after their recent successful season. The coaches involved in the task were all non-cyclists but agreed to tackle Hadrian's Cycle Path, which spans the width of the country. Starting in Ravenglass, west Cumbria at 4.30am, with a gruelling path to Tynemouth ahead of them, the group of eight riders began the long trudge with high hopes after several months of tough training, crossing the finish line around 8pm. A number of the club's players also joined in with the team spirit, cycling a small section in the middle of the trail. The club, which revels in its ability to train youngsters to play competitively alongside other junior league clubs in the region, is keen to attract new members to the club next season, and support boys and girls from six to 12 years of age. An open day is to be held on September 12 to welcome potential members to the club, who meet every Sunday morning at Haydon Bridge High School for training or competitive games with local sides. 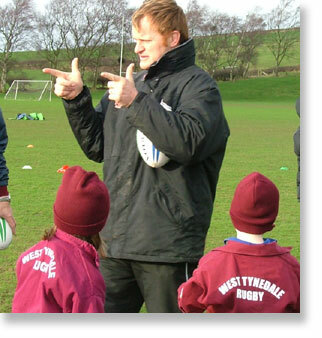 Chairman of Tynedale Junior RFC, Colin Stewart, from Allendale, said, "All of the coaches at West Tynedale Junior Rugby Club set ourselves the challenge to make a difference for all of the children who want to take part at the club. "We are proud to say that the event was a total success, and we look forward to finding out how much we have raised. However, we weren't completely free from disaster, sporting two punctures, one crash, and one total bike re-build, all while battling torrential rain and strong winds! "By raising money in this way we can offer team supplies to the children without having to rely solely on parents. It was a tough challenge, but it has generated a fantastic outcome and we are all very grateful for the wonderful support we have received from both parents and children. "We hope that this loyal following and team spirit will encourage new members to become part of one of our teams next season and represent what is already a thriving club." Falcons 1st team player and local hero Johnny Williams and giant lock Stuart Walker visited our club to assist in our training. It was a wind swept cold and gray morning but that didn't stop a big turn out. I think the pictures speak for them selves! Enjoy!! A very big thank you to Johnny Williams and Stuart Walker!!! For the first time we had our winter party on the same day as a match thinking the kids would be just a bit less noisy. Failed again!! The numbers were also up by over 30%. The evening kicked off with games for the children as well as the return of �I�m a rugby player, get me out of here�, this time I�m glad to say no one was sick!! As usual Langley Castle exceeded our expectations and provided a fantastic meal. We also had our quiz and a raffle with lots of prizes, which seemed to go on forever. Once again I would like to thank Anton for providing us with a great setting for our party. Over 250 players representing 20 teams decended on Haydon Bridge High School for the West Tynedale Junior Rugby Club inaugral rugby tournament.The club has played many fixtures in the 12 years of its existence but a sign of its growing popularity is its ambition to stage a tournament of this scale across the age groups. The aim was to start at 10.30 and finish by 12.30 with each participant playing as many games as possible in a round robin format. This was achieved with slick organisation but in a friendly atmosphere of cooperation which was commented on by all the visiting clubs who all made a point of praising the organisers and asking to be invited back next year. The general atmosphere was helped by the lovely weather and the wide selection of cakes, biscuits, sausage rolls and liquid refreshments eagerly devoured by players and parents. 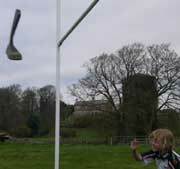 The 20 teams came from 5 clubs;- Carlisle, Ponteland, Gateshead Fell, Ryton and the host club West Tynedale. All share the same philosophy that each player regardless of ability should be playing as much as possible, thus players take it in turn to be substituted and all play a fair amount. At U12 level West Tynedale came close to winning the tournament just losing the one fixture to winners Ponteland. 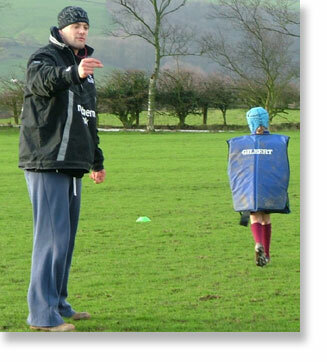 At U10 level West Tynedale were able to field 2 teams of equal ability. Both were competitive and finished 3rd and 4th to eventual winners Ponteland with Gateshead Fell a close second. At U8 level West Tynedale again went close just loosing the final tag game to Carlisle which decided that Carlisle won the tournament with West Tynedale 2nd. At U6/U7 level games were played but in keeping with the spirit of this age group nobody kept the score as participation is the main aim at this age. West Tynedale celebrated yet another successful season with a great fun day. From the start at 10.30am the excitement began. The field was marked out with cones to show the events. 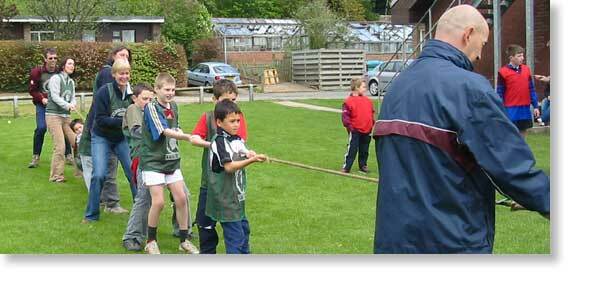 There was toss the welly, tug-of-war, toss the tackle bag and a circuit training course. All children and adults entered into the spirit of the games, a little light hearted banter and cheating was noted, but only from the parents! 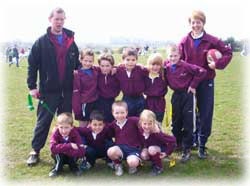 The tag rugby games also produced an array of rugby talent; the children were very focused and ran around the parents with skill! The parents, what can we say ,some can play and some are just enthusiastic, others just cheat!! But the jumpers came off and everyone ran around like true professionals. The day was finished with a buffet of hot dogs, sandwiches & cake, well known athletes food! The out going chairman Brendon Jackson presented the children with a certificate to show how well they have performed this year in rugby. We even had a quick happy birthday for one boy who was 10. We are saying thanks to Brendon for being chairman this year and we welcome Barry Revels back to office. A big thanks to all the children for making this a good year, thanks to Mum, Dad Grandma�s and Granddad�s for bringing them to the training and matches. It is always a pleasure to welcome Barry Cook and his players from Consett. 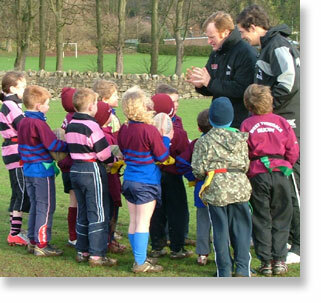 We split the kids into three groups of similar ages and abilities blew the whistle and of they went. In the two older groups Consett proved to be too strong for West Tynedale although with fantastic character and good tackling we were never far away and we give Consett and good challenge. 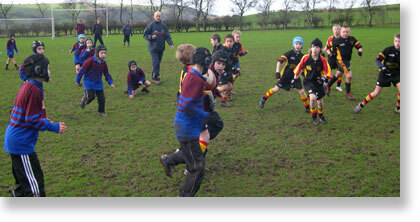 The younger group played tag rugby, the West Tynedale team proved to be very strong and kept a good line through out. The team was also very good at turning possession by achieving many double tags. A very big thanks to all the players, coaches, mums, dads and other spectators from both clubs for keeping this fixture as the one we always look forward to each year. Another fun filled and wild Christmas Party for the club in the setting of Langley Castle. This year we had record numbers with many new faces to join in. 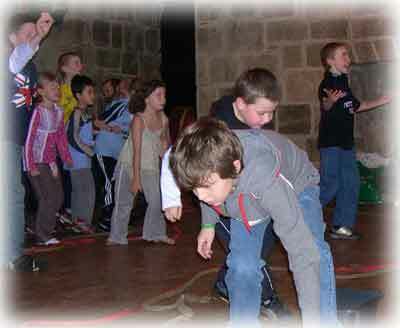 We kept the same wining format with many relay games and remote controlled car racing for the kids. Many thanks to those of you who give to a very well provided for rafel! For the adults we had bar and a quiz. Once again a big thanks to Anton and Linda for providing a great venue and the best curry in the north. 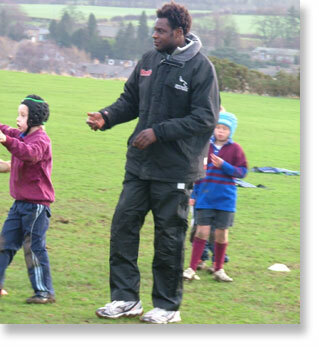 This year we have formed a partnership with Border Park Junior Rugby Club is as much as we train together sometimes and will play together against other teams. Border Park have travelled to us now it was our turn to go to Keilder. We had fantastic fun training in what, as you can see from the picture is stunning scenery. Have a look at the height of the posts behind, they are the tallest in England!! After training our energy was toped back up with a mountain of hot dogs! Many thanks to Tom and all at Border Park for making us feel so welcome, and we look forward to our next meeting. 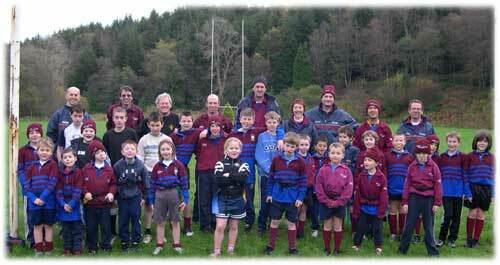 Another great fun day to mark the end of our tenth season, 2005 / 2006. With a good turnout we divided kids and players into four teams and started with some relay races to get the limbs warm and functioning. 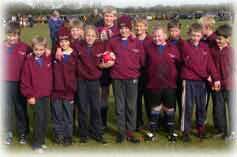 The same teams then went on to play the first round of tag rugby. This year we introduced a new rule, all adults were only able to run five steps before passing. The idea was to stop some over competitive parents. The new rule seemed to work until Brendon found a loophole! Between the tag rugby games, a new event was born to the fun day as the teams took part in �Welly Throwing� along with the traditional tug-of �war! SEMI FINALISTS - Well done to a team, unlike the opposition teams, had limited resources.  Thanks to Tynedale we were able to loan a player to make a full squad. 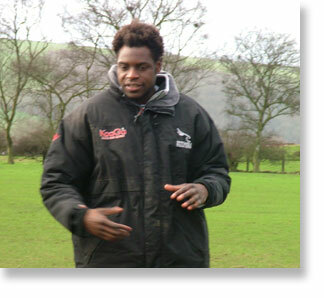 The conditions were ideal for rugby - testing by anyone's standards. We have to admit that this was a day thoroughly enjoyed by all. 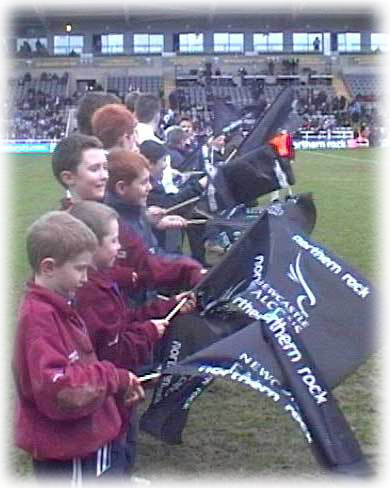 The team were able to parade around the grounds and then form the tunnel while waving flags for the main teams to enter the pitch. It was surely was something they will treasure. A big thanks to Carlisle Rugby Club for hosting this fixture. We turned up with three teams U10s, U9s and a combination of U8s and U7s. 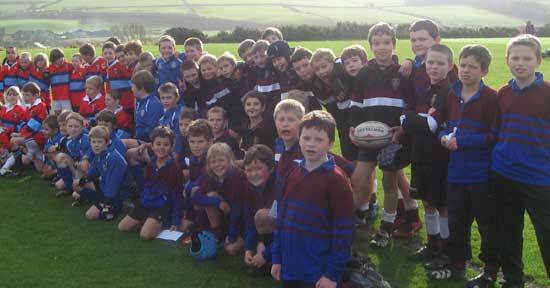 Carlisle fielded three very strong teams each of which were able to dominate and win over the West Tynedale children. Despite the results all kids had a great day as the games were played with good humour. 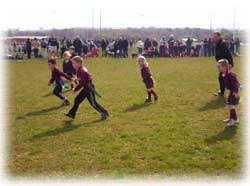 This was the first game our U9s played Contact Rugby, after a nervous first 5 minutes the team got used to the new way of playing and made some great try saving tackles. Even though the team lost the match it was very close with no injuries. Many thanks to Max and Liam from Carlisle who made up our numbers. Another fun filled and wild Christmas Party for the club in the setting of Langley Castle. This year we had record numbers with many new faces to join in. 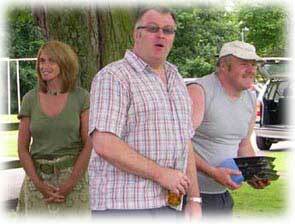 We kept the same wining format with many relay games and remote controlled car racing for the kids plus a new game introduced by Big Mike called "I'm a rugby player get me out of here". Thanks Mike!! For the adults we had bar and a quiz with I believe the usual winners!! Well done!! At the beginning of the year on a bleak Sunday morning a photographer from the Hexham Courant came to the club to take our picture with the equipment we were able to purchase with the grant money we received. The next week we all expectantly searched through the paper to find the picture, only to find a small write up. 7 weeks later there it was but without the write up. Still any publicity is good publicity!! 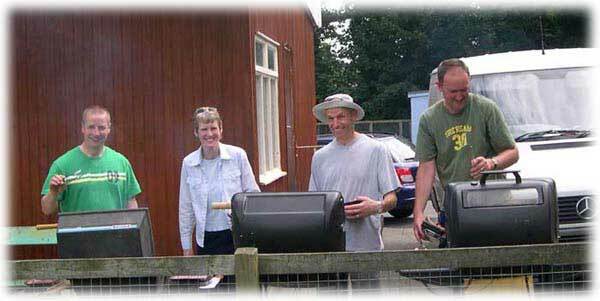 A very nice warm quiet Sunday morning for the residents of Belmont Gardens was altered by the arrival of the West Tyne BBQ. At 11am the sun appeared over the Yardarm, which triggered the start of the first race to the fridge. 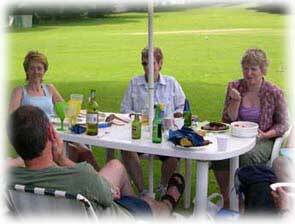 Cricket and West Tyne Rules Rounders was followed by a scrumage for Tom�s BBQ packs all washed down by assorted beverages. A big thanks to Ruth and her crew for organising this! Today the postman knocked at the door and handed me a box wrapped neatly in brown paper. I checked the name on the parcel as I was not expecting anything and to my surprise it had my name followed by West Tyne RFC. 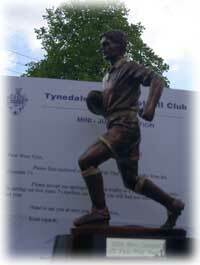 Please find enclosed your teams Fair Play Award trophy from the Tynedale 7�s. Does that mean we have to buy a trophy cabinet now?? 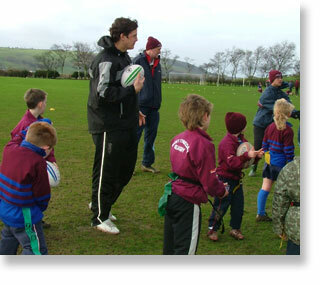 In the true spirit of Rugby a good number of parents and children turned out for the Fun Day. 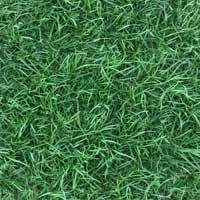 All those quiet parents that stand on the touch line sedately cheering their children on all year, were seen galloping up and down the field in fantastic rugger style! Thank you to all who came along and participated in the games, you made the day. The tug-of-war was evenly refereed by Johnny? and there was NO cheeting by any team at all!! As for the matches, the improvisation by the dads when there were no tag belts was great. Small children were seen to be lifted up, and yet thier legs were still going round as the ball was gently taken from them. It was poetry in motion. The rain only served to cool the ardour of some of the over competitive parents...and that means all of you! The tuck shop did a good trade and was certainly very crowded when it poured down! Once again, thanks to all who came and sorry to others who couldn't make it. But there is always next year! A fired up and motivated U7's made it through to the semi-finals at the Alnwick Tournament. The team consisted of Catherine Sadler, Hannah Illingworth, Ben Fleming, Harry McPartlin, Tom Thomson, William Bell, Ed Jackson, Mathew Jackson and Adam Todhunter. There was plenty of try's being made and a couple of the team have got double tagging of the opposition perfected! Total score was won 3 ,drew 1, and lost 1. This was a fantastic score line and the children know how much they have improved since last year.It was a real team effort with everyone having something to give to the game. Our U7's were beating teams from much bigger clubs, teams they had no right to beat, so thought one of the Morpeth parents. 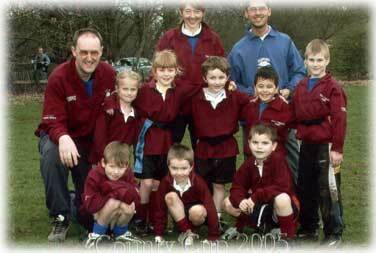 The U7's were nothing but GREAT! A big thank you to all their hard work and training through the season, and thanks to the Mums and Dads who came to cheer them on. end there was the same amount of matches won as lost. look forward to this fixture next year. The County Cup was late this year due to the bad weather experienced in February. were accompanied by their enthusiastic supporters. 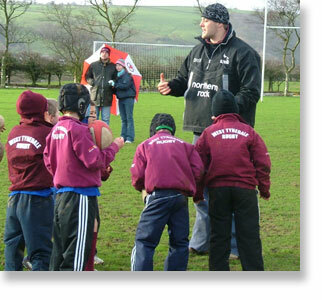 The U10s put in a very brave effort but were beaten on the day by much bigger teams. What do these townies feed their children!! as you were almost the first team we have ever had to reach the finals. What a great night for all at Langley Castle, the players and other kids had a wild time with lots of games provided by the coaches. 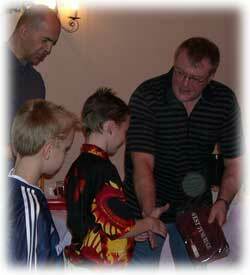 Each player at the end of the night received a West Tyne boot bag. 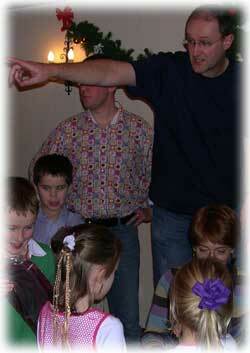 As usual the adults were teased by Ridley�s quiz which seems to get more challenging each year. A big thanks to Anton and Linda for providing a fantastic venue and a delicious meal. 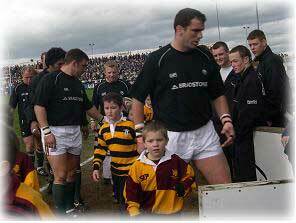 A team of 13 U10s' and a bunch of fanatical supporters went to Kingston Park to take part in this annual event. In the qualifying matches we played Grimbsy, Percy Park, Middlesborough and Novos. We lost the first two matches to a narrow margin but pride was restored when we won against two very good teams from Middlesborough and Novos. We did not advance any further. Following the Tag we watched the Falcons hold Saracens to a 20 - 20 draw, the match was saved by a last second drop goal by the players hero Jonny Wilkinson. 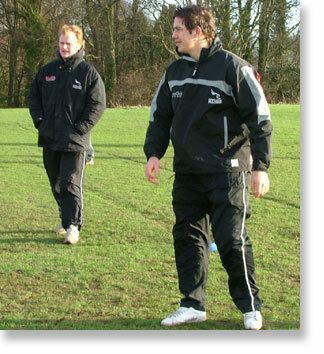 Consett travelled on mass to us for the first match of the 2004 / 2005 season. We had three pitches on the go. 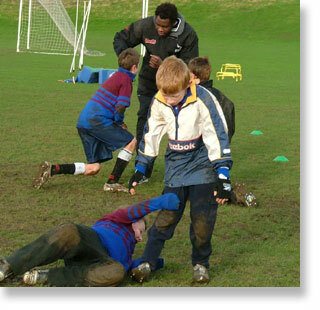 One for the U7�s and U8�s tag, one for U9�s tag and the other for U10�s and U11�s contact. 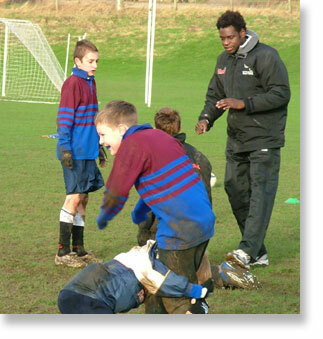 This was the first experience for our U10�s playing against opposition in a contact match. Luckily there were no injuries although some players went home proud of minor bruises. We would like to extend a big thanks to the Consett players and supporters for their help in making this a fun fixture; we look forward to the away fixture on January 23rd. One sunny day one of our crew thought it would be a good idea to have a picnic to bridge the summer gap. Well we did but on not such a bright day. Still we are from the North, rain was not going to dampen our fun!! Following a kick about with several shaped balls, rock climbing and paddeling in the river both us and the midgies sat down to a hearty lunch. The afternoon was nicely 'rounded' off with a game of rounders (West Tyne rules applied) before a monsoon stoped play. A squad of 10 Under 11s and fanatical supporters made the trip to Tynedale Park and successfully qualified for the quarter finals against Tynedale 'C'. Although the team did not progress any further in this competition they won the best prize of all, bringing home the 'Fair Play Award'. Well done to all. On a blustery Sunday morning a group of 21 (10 players and 11 supporters) travelled to the Falcons to take part in the U8s tag festival. We were in a group of six teams, the winner of the group to go through to the semi final. The other teams in our group were Middlesbrough, Northern, Alnwick, Sunderland and Morpeth. West Tyne played well but were unsucessful to qualify. After the match the team was given tickets to watch the Falcons play Leichester Tigers. This was a great opportunity for the boys to see some heros from the world cup including Neil Back and Martin Johnston. Congratulations to France who won the final match of this years Six Nations to become Grand Slam winners. Also congratulations to Ireland who won their first Triple Crown since 1987.